Often overlooked in favour of New York or San Francisco, the ‘Windy City’ of Chicago doesn’t fall short as a centre of culture, art and architecture. Soaring towers befitting the birthplace of the skyscraper are stacked high along the stunning Chicago River and throughout the sprawling metropolis. This is also the home of blues and jazz, where early masters such as Louis Armstrong honed their skills. Situated on beautiful Lake Michigan, Chicago’s countless bars and restaurants are lively and usually full – especially if a game is on. The friendly locals are sports mad, with American football, basketball and baseball all popular. The live-music scene is vibrant (with plenty of blues bars), while there are also renowned festivals, a world-class symphony and some terrific museums – such as the Art Institute with its extensive French Impressionist collection. Then there’s the stunning Millennium Park, which opened in 2004 and features work by Frank Gehry, Jaume Plensa and Anish Kapoor. The Downtown area is known as the ‘Loop’ after the raised metropolitan railway that circles the central business and shopping district, and many visitors take to the iconic waterways to tour this area’s colossal architecture by boat. The 10-floor Home Insurance Building constructed here in 1884 was the first skyscraper, ahead of Hotel Burnham (formerly the Reliance Building), which was the first steel-framed skyscraper. It also houses one of the world's tallest buildings, Willis Tower (formerly Sears Tower). Famous architects such as Louis Sullivan, Mies van der Rohe, and Frank Lloyd Wright and his Prairie School of Architecture have all left their mark here. But the city isn’t only interesting for its architecture. 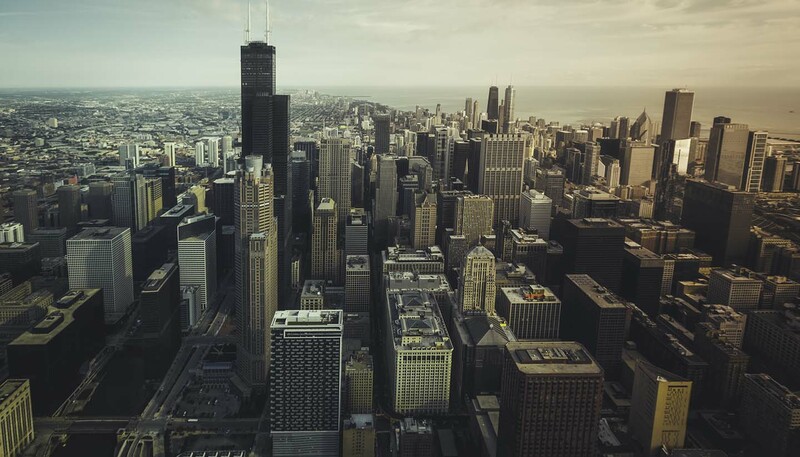 Chicago is a cosmopolitan hub with varied districts known for their Irish, Vietnamese, Latin-American and other connections, and it’s constantly changing. “It is hopeless for the occasional visitor to try to keep up with Chicago,” said Mark Twain in the 19th century. “She outgrows his prophecies faster than he can make them.” Over a century later, his words still ring true.